H2H-#16_07s: The Peiper is Paid_Alt by Volcano Man. route for Peiper's KG was Route D assigned by 6th SS Pz Korps. Edited by Volcano Man, medium scenario 38 turns. edge of the map. Historically it moved south along two routes. the western route went through Stavelot-Wanne-Vielsalm-Poteau. get across the Warche anyway. I cannot stress enough that the unit ratings are so perticular that the following and exact optional rules must be selected or you could get results that are not intended. This is the case if you are playing a _Alt scenario as a ladder game or running a H2H test on a _Alt scenario. These optional rules are also found in each notes files in the Alt art / scenario pack. *Note* If you are playing an ALT scenario in an older PzC title that does not yet have the Quality Fatigue Modifier optional rule, then just play it without the rule. For the most part, the difference in results are not all that drastic as both sides suffer and benefit equally from the rules use, or non use. 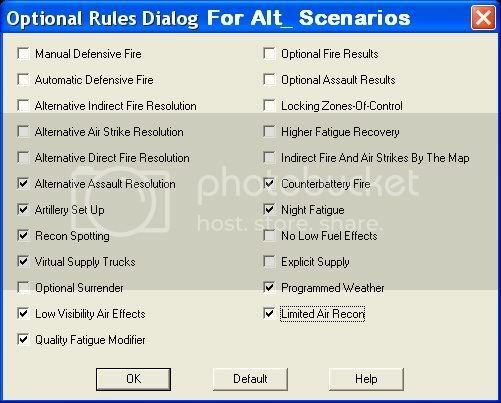 That said, the ALT scenarios were created with this rule in mind so when it becomes available you should use it. Any comments/feedback can be posted in this thread.